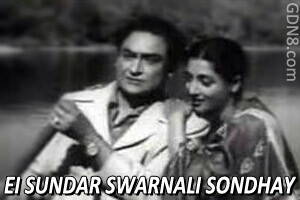 Ei Sundor Swarnali Sondhay Lyrics from Hospital bengali movie. the song is sung by Geeta Dutt music composed by Amal Mukherjee. starring: Ashoke Kumar and Suchitra Sen. Remake version sung by Indranil Sen.